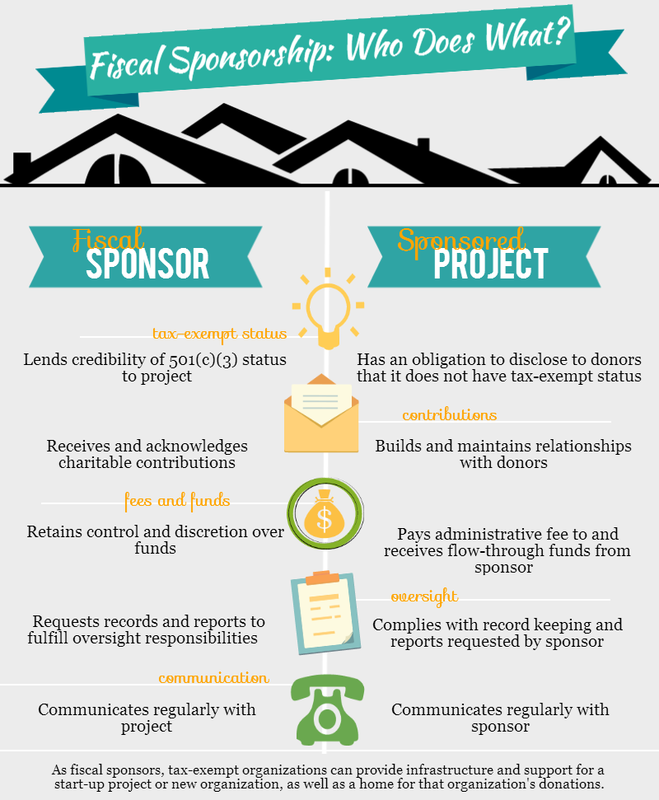 Fiscal sponsorship is a formal arrangement in which a 501(c)(3) public charity sponsors a project that may lack tax-exempt status. The Arts Area supports creative projects and new organizations in its service area by extending their charitable umbrella to include these projects, sparing them the burden of securing immediate nonprofit status and providing eligibility for charitable donations, seeking grants, and institutional support. In a Comprehensive Fiscal Sponsorship relationship, the fiscally-sponsored project becomes a program of the fiscal sponsor, and is a fully integrated part of the fiscal sponsor that maintains all legal and fiduciary responsibility for the sponsored project, including its employees and activities. In a Pre-Approved Grant Relationship Sponsorship, the fiscally-sponsored project does not become a program belonging to the sponsor, but is a separate entity responsible for managing its own tax reporting and liability issues. In addition, the sponsor does not necessarily maintain ownership of any part of the results of the project’s work—ownership rights may be addressed in the fiscal sponsor agreement and could potentially result in some form of joint ownership. The sponsor simply assures that the project will use the grant funds received to accomplish the ends described in the grant proposal. NEW | This is a purely administrative service where the fiscal sponsor’s ability to receive deductible contributions isn’t necessary. Under this model the fiscal sponsor can provide various professional business services, for example, accounting services, marketing, grant writing, and other back office work to another 501(c)(3) charity recognized by the IRS. Here, the fiscal sponsor lacks any discretion or control over the spending of funds. If you are a 501(c)(3) public charity interested in a Technical Assistance model of fiscal sponsorship, please contact The Arts Area for more information. Using a fiscal sponsor enables a project or organization that does not itself qualify as tax-exempt to attract funding for its operations that will, through the fiscal sponsor, be tax-deductible to donors. Therefore fiscal sponsor arrangements benefit projects or organizations that are not tax-exempt by providing a flow-through pathway for revenue that the organization may not otherwise be in a position to receive. Fiscal sponsorship might be chosen by a newly formed nonprofit seeking to test its ideas to determine whether there is a market or a desire among the public to fund the end product. Some projects or organizations remain in a fiscal sponsorship relationship for a long time, deciding that their mission can be achieved in that structure without creating a new entity. Some organizations, including those that are themselves tax-exempt, find that utilizing a fiscal sponsor for technical assistance to outsource administrative responsibilities, whether back-office tasks, or those relating to fundraising and disbursement of funds, is the right business model for them. This structure might be particularly well-suited for all-volunteer organizations. What are the mutual expectations of a fiscal sponsorship relationship? Does a fiscal sponsorship sound like a good option for your project or organization? The next step is to complete The Arts Area Fiscal Sponsorship Proposal Narrative form.